I picked this up from out Spring Scholastic Book Fair. The cover grabbed me! Luckily, once I started reading it-the story hooked me as well. The story is a little bit tall tale mixed with Spy Kids. My daughter, also attracted to the cover, asked me to read it with her after starting it myself. Oh, what fun some books are to read aloud! I cannot do a great English accent like the rest of my family so she has to listen to Harry Potter in "American English" but I can do a Southern drawl from our three years in Little Rock and Piper and her parents have drawls! This was her plan-climb to the top of the roof, pick up speed by running from one end all the way to the other. Jump off. Finally, and most importantly, don't fall. Piper McCloud is a character with big plans and great ideas throughout this delightful book. 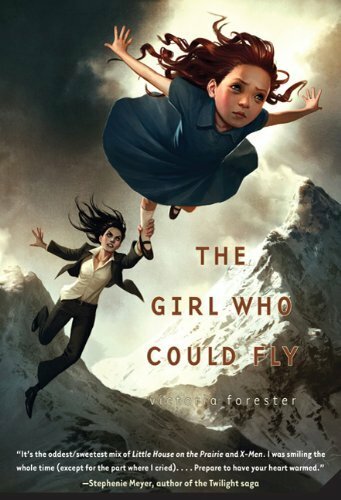 She lives with her ma and pa on a farm in Lowland County, Southern USA and discovers at an early age that she can lift off the ground and eventually by meditating on the idea of flying she can make it happen. Even beyond her flying ability she is a rare and uniquely sensitive young girl. She questions her farmer father about cow's having feelings as she clearly watches a mother cow mourn for a lost calf! But alas life never remains in balance and Piper's flying ability is discovered by the townsfolk and she is ostracized for being so radically different from the norm. Enter her saviour -Dr. Hellion (great name), who whisks her away in a helicopter to a safe haven for kids who are "different." I.N.S.A.N.E is Dr. Hellion's school for children who are "lost" in the world because of their special abilities and Dr. Hellion runs it with a crew of minions. They've made it a very desirable place to live with special diets, comfy beds and clothing made-to-order. Piper, having been homeschooled, is thrilled to be surrounded by other children for the first time in her life.